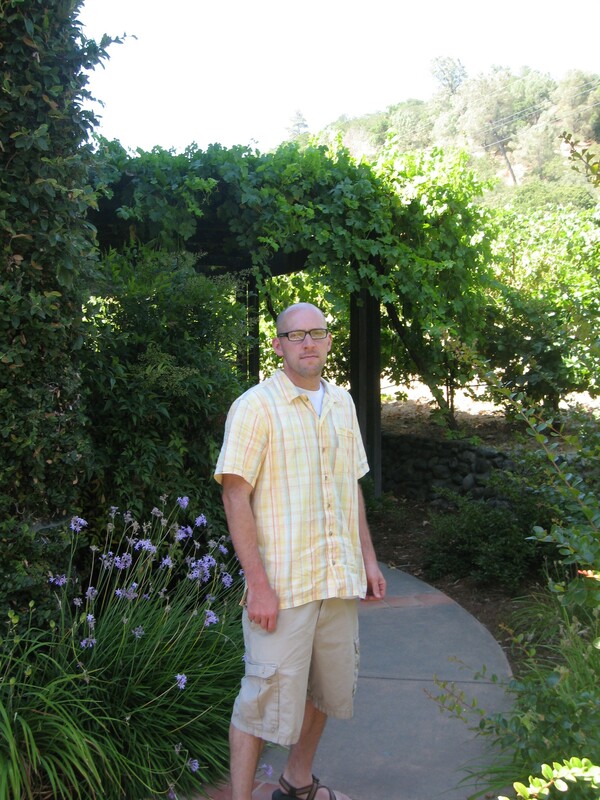 The next day of our wine tour we decided to go to the Sonoma Valley, which is just southwest of Napa Valley. Napa focuses on Chardonnay and Cabernet Sauvignon, where Sonoma focuses more on Pinot Noir and Zinfandel. 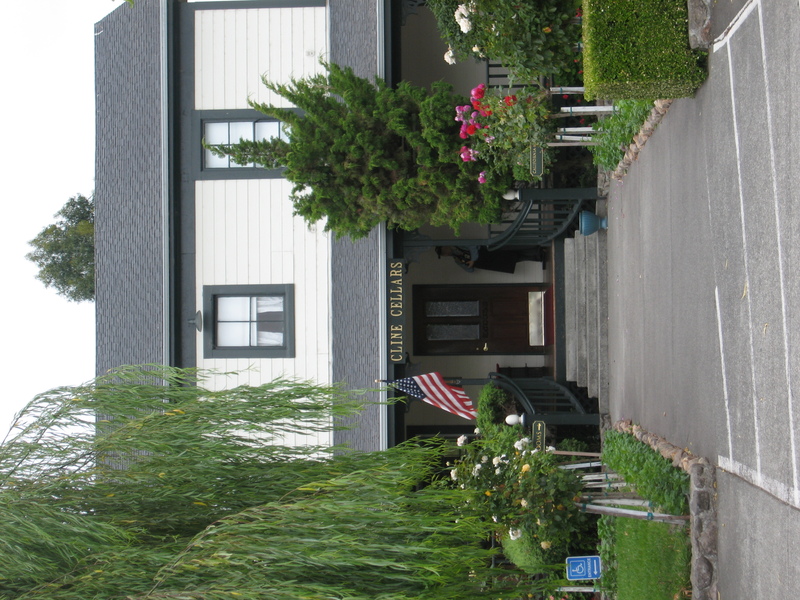 We decided to make our first stop Cline Cellars. We tried a Cline Syrah from the grocery store on our first night, and we were so impressed that we had to make a visit. They have very reasonably priced wines, starting at $11 a bottle. We stopped by at 10:30 on a Tuesday morning, and this place was hopping! There were already almost a dozen people tasting, including a local character who had the whole tasting room laughing. Our server, Rene, was excellent – personable, down to earth and he knew a lot of the wines. I did stump him though, when I asked questions about one of the rare varietals. I liked that he admitted he didn’t know the answer, instead of trying to pretend. And then he pulled out an awesome book with every grape varietal known to man! Their Syrahs were good, their Zinfandels were very good, and Jon and I both enjoyed their Mourvedre and Carignan (a varietal that I have not heard of before). After our tasting, we enjoyed a picnic lunch at their picnic table with wine, cheese and pepperoni that they also sell onsite. We toured the grounds, which included a fishpond complete with turtles and frogs, and two mini-donkeys that the kids can feed carrots. And to top it all off, they own replica models of the 21 California missions. These models were made for the 1939 World’s Fair using the original blueprints for the missions. It seems that when they were going to be auctioned off piecemeal, Cline’s owner bought them all, and then built a museum on the grounds to display them. They were very cool – an unexpected treat. We will certainly be back again! After Cline, we went across the street to Jacuzzi Winery. They are owned by the same family, but while Cline focuses on Zins and Syrahs, Jacuzzi focuses on the Italian varietals, some of which I had never even heard of. They did have some good wines, but unfortunately, the experience we had there didn’t make their wines worth it. Our server barely looked at us, and when I asked him which he thought were the best wines to taste (you get to choose 5 from the list), he informed me, “I can’t tell you what you’ll like.” Well, duh, but surely you can tell us which ones are your best wines. It irked me, because any winery that doesn’t specialize is going to have some that are better than others. The snooty server also said, “I won’t tell you that our wines are better than Cline wines, but they are.” Wow, selling out your own partner winery just isn’t cool. That said, we liked their Pinot Noir, and their Dolcetto, but left without buying anything. We tried to taste their olive oils, but it was so busy and crowded there, we gave up. All in all, I thought Jacuzzi was a dud. After Jacuzzi, we went into Sonoma’s downtown for a bit, and toured the Sonoma Mission. 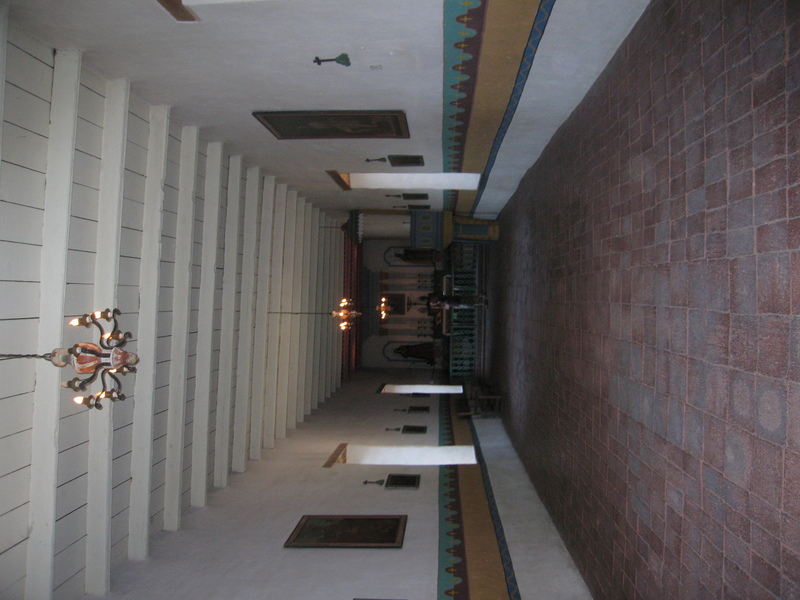 It was the last mission built in the string of 21 California missions, founded in 1823. It was only a religious mission for 11 years. In 1834, the Mexican government secularized the missions and put General Vallejo in charge of Sonoma. He founded the town on Sonoma around the mission, and they used the mission as a parish church for a time while the mission started to fall into disrepair. It was mostly crumbled after the 1906 earthquake. Fortunately, they started restoration in 1909, and the mission became a museum in 1913. It is one of two missions that are part of the California Park System. It is a neat mission and well worth the $3 fee, and is easily toured in about 20 minutes, unless you want to watch the 20 minute video. You can also see the Barracks, and General Vallejo’s home. It is certainly worth the visit – it is interesting to imagine what life was like during the period. We started our first full day in Napa Valley with a walking tour of the downtown area. 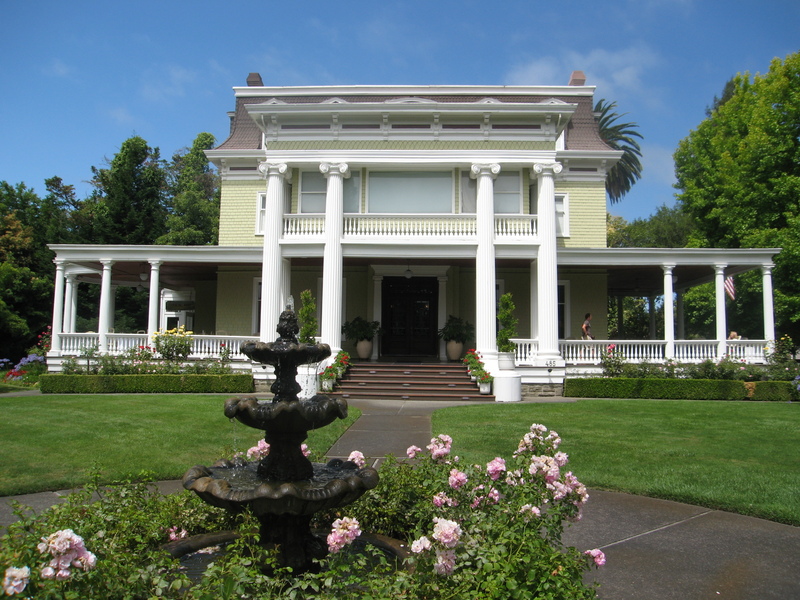 We got a tour with historical facts about Napa, the architecture, and even a beer tasting. Beer was the dominant production in the area until wine took over in the 1870’s. Our tour was very interesting, and we got to see inside a beautiful turn of the century mansion that is now a B&B, Churchill Manor. Edward Churchill built it in 1889, after making his fortune in banking. Churchill also owned a beer brewery called the Golden Ribbon, and the Tokalon Vineyard. The vineyard land was approximately 700 acres, and is now a part of the Robert Mondavi Winery empire. Jon and I both would like to stay there one day – when we can afford it. Until then, our economy lodging. Churchill Manor - one day we will stay here. After the tour, we headed up the wine trail. We had lunch at the Pacific Blues Cafe, and had a great pulled pork sandwich and Cobb salad. We browsed in a wine shop that had a fantastic selection of rare wines and everything you could imagine… from California. It seems California doesn’t believe that other wine areas exist. We saw two lonely bottles of Oregon Pinot Noir. So, our first stop for wine tasting was Robert Mondavi. Big producer, big attitude is apparently the theme here. We stopped in the tasting room, where we got to listen to a waiter from Canada schmooze the server into a free “industry tasting”. You have got to be kidding me… but it worked. But it seems that most of us can get a free tasting – Jon and I did too, with a coupon. The server basically ignored Jon, but gave me a bit more attention. We tried wines that ranged from $80 – $160, and while they were decent, there wasn’t one that I would have bought at those prices. I’ve had better $30 reds at home. We left there feeling like we had just had a very strange experience. At least we checked Mondavi off our list – but they at least could have told us about the Edward Churchill connection. Next stop was ZD Wines. This was a spur of the moment choice, but an excellent one. They focused on Chardonnay, which is 80% of their production, and it showed. We both loved their Chardonnay. We also really enjoyed all of their other wines, but the price points are a little steep for us. The folks at ZD are a fun, lively bunch, who are very friendly to chat with. No weirdness here – ZD was more like the wineries in Washington and Oregon. They recommended a stop at Peju, so that’s where we headed next. Peju does a very regimented tasting. You are put on a list, and then in groups of 10, shuttled into the tasting room. Our server was a bit of a schmoozer – it seems that they are on commission there, and he liked to use the “grandchild needs some shoes” bit. He also thought Peju wine was the best on the planet. Jon and I disagreed. We enjoyed their Sauvignon Blanc, their Merlot, Syrah and Zinfandel, but the rest we could take or leave. The group next to us at the tasting recommended we have dinner at Go Fish, a seafood restaurant in St. Helena. It was our splurge dinner for the trip. Jon had the halibut, I had a Chef’s plate of sushi. The halibut was very well prepared, and delicious, but Jon left hungry. We brought a bottle of our ZD Chardonnay to enjoy with dinner. YUM! In the end, we learned that some places in Napa are of the snobbish variety. I guess we’ll just have to figure out which ones we like and don’t like along the way. Family-owned winery in WA or OR means it is a small boutique winery, where you will usually be served by the winemaker or a family member. The family-owned distinction in Napa means nothing to the consumer – these families are rich and their wineries are just as big! Every famous person in the world it seems has started a winery in Napa/Sonoma. The Andretti family of racecar fame, the Jacuzzi family of hottub fame, Francis Ford Coppola, are just a few. But… it doesn’t necessarily mean they know good wine. It seems Napa is all about who you know. We flew down on Sunday, July 25th and arrived at the Oakland Airport. First on the agenda was a stop to the Winchester Mystery House in San Jose. I have been wanting to see it since I was about 8 years old and saw it on Ripley’s Believe It or NOT! For those of you who haven’t heard of it, like Jon, Sarah Winchester was the widow of the 2nd President of the Winchester Repeating Arms Company. Her only child died in infancy, and her husband died when she was in her forties. She bought an 8 room farmhouse in San Jose, hired a team of carpenters and set to work renovating and adding on. Legend has it that her spiritual advisor told her that she was cursed, and that she must build continuously in order to confuse the spirits of the people who were killed by Winchester guns. At the time of her death, her home had 160 rooms and all sorts of crazy architecture. Of course, I didn’t realize that now it is right in the middle of San Jose. There is a mall across the street, and a huge movie theater right next door. So, the final verdict…. It is touristy, and we had to wait about an hour for our tour. They do small group tours though, so you can ask questions and interact, and they give you enough time to look around. It was certainly worth it and we had a great time. It had it all: a door that opens onto a second floor drop, windows that look into other rooms, skylights in the middle of the floor! You can see the progression of her insanity – at the beginning her renovations made the home much more ornate, but then later it seemed to get more “builder grade”. I wish they would have told us about the ghosts though! It did make me wonder if she had lived today, would she had been deemed insane and committed? We drove to Napa in the late afternoon. Once we checked in to our lodge, we drove around downtown Napa a bit and got our bearings. We had dinner at ZuZu, a tapas place in downtown Napa that focuses on locally grown ingredients. Their mussels were fantastic! Their paella was good… but we’ve had great paella at a couple other places. I’m still looking for a paella that can beat the paella I had in Grand Rapids, Michigan of all places! All in all, the first day was a great day. The only low point was definitely Jon hitting the squirrel running across the onramp on the freeway. We had to drown our sorrows in wine. In less than a week Jon and I will be Napa Valley bound for the first time. We are very much looking forward to getting away on our first of many honeymoons, and celebrating our one-month wedding anniversary. Cheesy, I know, but it is fun anyway. Having never been there before, I scouted out the non-wine itinerary. 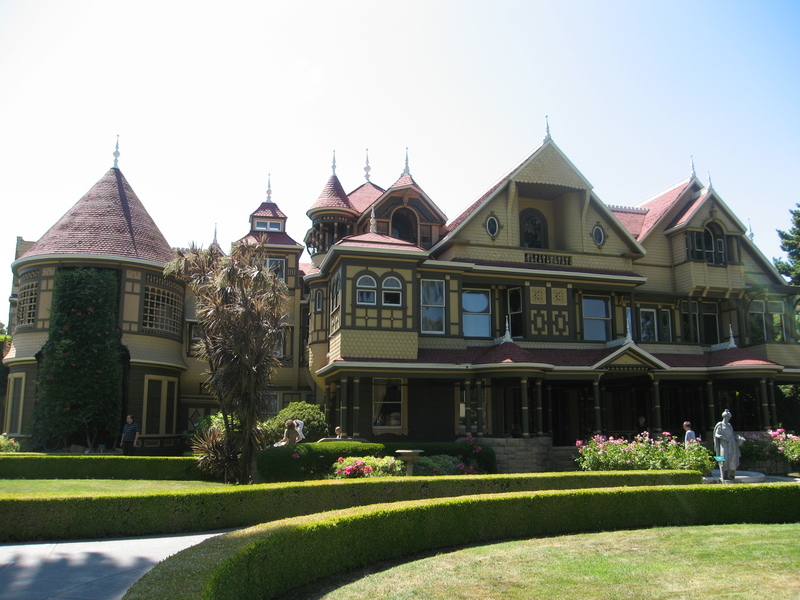 We are detouring to San Jose to go to the Winchester Mystery House, and then we’ll be heading into the valley, for 3 days of wine tasting, good food eating, relaxing, and more. Our lodge has an outdoor pool! It doesn’t take much to make me happy. I’m also going to try to talk Jon into going to Calistoga to see the geyser (a regularly spouting geyser like Old Faithful, but probably smaller). And…. they have fainting goats! The kind that get startled and fall over into a semi-sleep trance state. I’ve seen them on TV, but never in real life. This is a real draw for me – call me immature, but you know you want to see them too. I’ll take pictures, but somehow I’m sure the stills won’t really capture the whole “fainting” concept. Jon is in charge of all things wine-related. He is hemming and hawing about which wineries to visit, since we obviously can’t visit them all. He probably won’t have it narrowed down before we go, and I’ll just have to say – STOP! Go there! This is usually how it works. That’s fine, I’ll be happily consumed with Mystery Houses, swimming pools, and fainting goats. On Friday night we spent the night in Woodburn, Oregon, right near the outlet mall. We started our day out by venturing over to the outlets, where Jon found a pair of nice shoes at Bass and we cleaned up at Columbia. I got two nice lightweight summer jackets and Jon got a button down shirt. With the shopping urges quenched, we made our way over to the Newburg/Dundee/Carlton wine country. We’ve been to several in the area before, so we decided that we would make some stops at places that we had never been to before. Our first stop was at Carlo and Julian Winery. It is located in a shop behind the owner’s house, complete with cats and chickens and a little girl running around. They are very friendly people, but we couldn’t help feeling like we were imposing a bit. We were the only ones there, but it was still early in the day. We tasted several of their vintages of Pinot Noir, as well as a Tempranillo and a Malbec. The Malbec was very good, but is was pricey, and good Malbecs are easy to come by at lower price points. We ended up buying two bottles of Pinot Noir, 2006 and 2008. Our opinion was that their Pinots didn’t have a lot of variation in taste between years. We are curious to see how the 2008 ages. Next we went into Carlton and wandered randomly down the street. 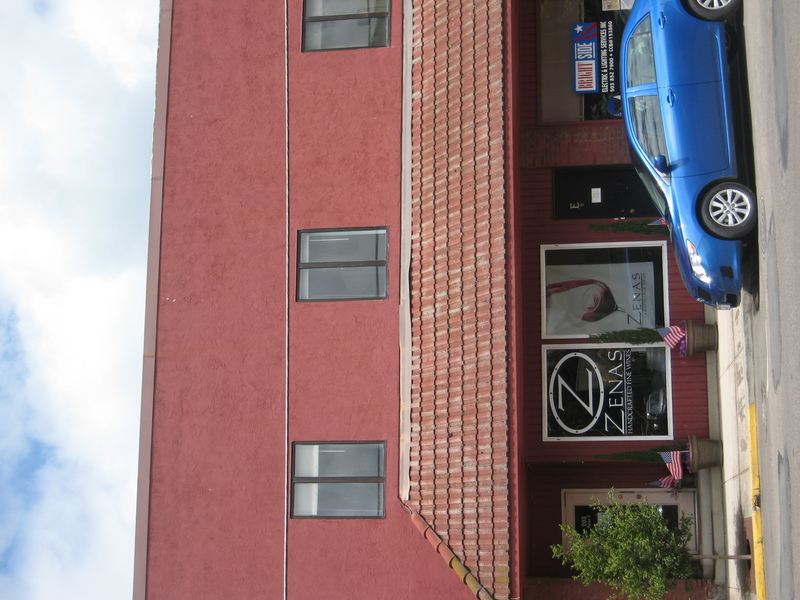 We stopped at Zenas Wines on the main street in Carlton. The winemakers are two young brothers who are very interested in the technical aspects of winemaking. If you are interested, they will go into great detail about the process. What we found refreshing was coming across a winery that doesn’t focus on Pinot Noir, and makes some really great wines. We liked them all and had a great time visiting. We bought three bottles there, their 2007 Meritage, the Cabernet Franc, and their Riesling. We will really enjoy these when we open them, I’m sure. A little further down, on the opposite side of the street is Alexana Winery. They offer a Pinot Gris and two Pinot Noir’s, with grapes from different vineyards. Their Pinots are excellent, but on the pricey side. Their tasting includes their high priced Pinot Noir. We loved it, but at $75, it is out of our price range. All in all, a great day. The weather was nice, everyone at all of the wineries was friendly and easy to talk to, and they are very proud of their wines. Each day in the Willamette Valley is different, because it would take a lifetime to go to all the wineries. We will certainly try though! On Friday we started our day in Goldendale, WA. We headed out to the Maryhill Museum, which is a huge mansion built above the Columbia River Gorge by Sam Hill, who brought the railroad through the valley. He built this mansion intending for it to be his home, but before it was finished donated it to become a museum. They have a collection of Rodin sculptures, furniture belonging to the Romanian royal family, chess sets and paintings. It was a nice start to the day, and reasonably priced at $7 for an adult admission. Next we stopped at Maryhill Winery, one of the biggest producers in WA state. They have a large selection, something for everyone. We had a nice Viognier, but we didn’t think there was anything outstanding there. The view is gorgeous, and it would be fun to take in one of their summer concerts. But it is quite far out of our way. Next up was Waving Tree Vineyard. We stopped here because it was close to Maryhill and close to the replica Stonehenge monument, and we are glad we did. They have an extensive wine selection, and we found many that we enjoyed. We ended up buying 5 bottles. Their Zinfandel was excellent and very reasonably priced. I’m hoping that his wines make it to distribution closer to home. We crossed over the Columbia River and make our way towards Portland, Oregon. We stopped for awhile in Hood River, Oregon and had dinner at the Rogue Brewery there. I thought my babyback ribs were a bit too spicy, but the beer and cheese soup was out of this world. And the beer is good too!